If you’ve been in the gut upset world for a little bit, you’ve likely come across digestive enzymes. You may have stumbled across them in the pharmacy isle, or heard of a friend who swears by them. As dietitians, we certainly get lots of questions about digestive enzyme supplements, and whether they are helpful for calming the gut and improving digestion. Most foods we eat contain a range of nutrients including proteins, carbohydrates, fats, vitamins, minerals and trace elements. Digestion essentially starts in the mouth – this is where food is manually broken down into smaller pieces by our teeth, and pushed down the oesophagus into the stomach. The stomach is a muscular pouch, that literally tosses food around and grinds it up into even smaller pieces. In the stomach and small intestine, the food encounters acid and enzymes, which breaks the food down (at a molecular level) into shorter chains and then single molecules, small enough to be absorbed across the gut wall and into our blood stream. Proteases break down proteins, lipases break down fats and amylases breakdown carbohydrates. Do digestive enzyme supplements help to absorb FODMAPs? ​​Excess fructose is already a single molecule (“mono” meaning single and “saccharide” meaning sugar), so there is nothing further to break down. High capacity – GLUT 5 is a specific fructose carrier. Its sole job is to collect fructose form the digestive tract and carry it across the bowel wall and into the body. Some people have low amounts of GLUT 5 and must rely on the secondary low capacity method of piggy backing with glucose. Verdict: Digestive enzymes, do not contain GLUT 5, so they are of no benefit to absorption of excess fructose. NB: It has been theorised that taking glucose tablets with foods that contain excess fructose can help. Firstly, this would only help with foods where fructose is the only FODMAP e.g. honey or mango. Unfortunately, Monash did investigate this back in2016and found that this didn’t make a significant difference to symptoms. Lactose is a double sugar molecule (“di” meaning two and “saccharide” meaning sugar) made of glucose and galactose. The glucose and galactose molecules rely on an enzyme called Lactaseto separate them in the digestive tract, before they can be absorbed into the body. Different people produce different amounts of Lactase. Some people are lactose intolerant, meaning that larger serves of milk or other high lactose dairy products can cause uncomfortable gut symptoms like diarrhoea, bloating and excessive wind. Lactase enzymes can be added commercially to milk and milk products or taken in tablet form with the lactose containing food. This addition of lactase, will break down the lactose and make it easily digestible by those with lactose intolerance. Verdict:​ In the case of lactose intolerance, deficiency of lactase enzyme is the key issue, so in this scenario, adding the right digestive enzyme can help.During the elimination phase of the low FODMAP diet, we recommend choosing lactose free dairy products where possible, and using lactase tablets as a backup when out and about. Some lactase enzymes contain high FODMAP additives e.g. mannitol, so check ingredients when purchasing. Some people are sensitive to other molecules in milk (e.g. casein or whey), in this case lactase is of no use. These FODMAPs are chains of sugar molecules (“Oligo” meaning few and “saccharide” meaning sugar). Depending on the type of sugar they are made of, they are known as Fructo-oligosaccharides(fructans) or Galacto-oligiosaccharides(GOS or Galactans). The human body does not produce the enzymes needed to breathe bonds in these sugars, and they are poorly absorbed in everyone. Because malabsorption of these sugars is normal, they can actually help keep our digestion healthy, by keeping the stool moving through at a desirable pace and feeding our gut bacteria. Gas is a normal side effect of eating oligosaccharide rich foods, but in people with a sensitive gut nervous system, it can cause uncomfortable bloating and wind. With these FODMAPs, we want to find the balance between enough to keep the gut healthy, and not so much that we are in constant discomfort. The question here is, can digestive enzymes help with gut symptoms from these foods? The answer is: maybe and maybe not. There has been some positive researchinto an enzyme called α-galactosidase for digesting GOS – available in some commercial enzyme supplements. The Verdict: Some people may find relief with α-galactosidase enzyme supplements taken with appropriate foods. 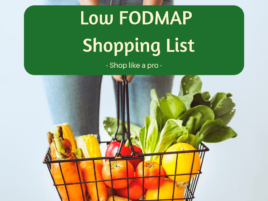 We recommend avoiding these during the Elimination and Challenge phases of the low FODMAP diet as they can cloud results. But, depending on your challenge results, you may want to trial these down the track to see if they are helpful, and can allow you to broaden your diet. ​These are a type of monosaccharide known as ‘sugar alcohols’. They are not like the alcohol you drink, but an alcohol because of the chemical structure of the molecules. They are also not digested properly by anyone, and usually act as a natural laxative, because of their osmotic (water attracting) properties when malabsorbed. Verdict:Because polyols are already single molecules, enzymes will not break them down further, or improve their digestion. In some of the cases outlined above, digestive enzymes may be helpful in assisting digestion and improving digestive comfort. But they certainly do not provide an across the board solution for IBS symptoms, nor do they replace a low FODMAP diet trial. If you chose to trial digestive enzyme supplements, we do not recommend doing this in the Elimination or Challenge phases of the low FODMAP diet. If you want to trial them in your long term management plan, lactase (for lactose intolerance) and α-galactosidase (for GOS sensitivity) are the best evidenced options.